Our Industry is evolving at a very rapid pace driven by new products, new market segments and new business models. How do companies keep pace with rapidly evolving market needs, stay ahead of the curve and create value through breakthrough innovation? If you look at examples of hyper-growth tech companies like Apple and Amazon, open innovation and co-creation is one of the core operating models to keep them agile in a hyper competitive space. Many other global companies outside the tech industry like GE, LEGO, Coca-Cola, NASA, Johnson & Johnson have implemented open innovation models to fuel their future growth. GE’s commitment to open innovation is clearly articulated in their open innovation manifesto (http://www.ge.com/about-us/openinnovation) – “We believe openness leads to inventiveness and usefulness. We also believe that it’s impossible for any organization to have all the best ideas, and we strive to collaborate with experts and entrepreneurs everywhere who share our passion to solve some of the world’s most pressing issues”. Open innovation is based on a very simple tenet that ideas can come from anywhere: suppliers in the current value chain, start-ups, entrepreneurs, end users/consumers, academia; key question is how do you organize yourself to capitalize on these opportunities and create value? One example of open innovation is how LEGO transformed their business by co-creating with consumers, as described in the book “Brick By Brick” by David Roberstson. LEGO invites their highly involved and skilled users to co-create new ideas / designs through an online portal (https://ideas.lego.com/). In this online portal, LEGO consumers can design either using LEGO bricks or computer 3D applications. Other users get to vote on these designs, once the idea reaches a targeted vote, LEGO can consider it as a new product by giving a small part of the revenues to the creator of the set. This model of co-creation motivates customers to constantly create new innovation and fosters a sense of entrepreneurial creativity. Coca Cola participates in similar co-creation on new flavors through the Freestyle dispenser machine that allows users from around the world to mix their own flavors and suggest a new flavor for Coca-Cola products. The new product records the consumer flavor so they can get it from other Freestyle machines located around the world using the Coca-Cola mobile application. This model of open innovation puts the consumers at the heart of the product development process by using these suggested flavors as external ideas that are evaluated as a new product line. Eric Von Hippel in his book “Democratizing Innovation” describes co-creation by highly sophisticated sub-group of end users he calls “lead users” to innovate for large firms. He argues that with advances in computer and communications technology, users will continue to develop new products in the future. Van Hippel’s many examples of user innovation in action range from surgical equipment to surfboards to apps to software security features. It makes sense for companies to co-create with a community of lead users. While organizations can participate in the idea of open innovation, to be successful in drawing value from open innovation it is very important to have the right organizational structure & culture. How do we create value by harmonizing– internal and external ecosystem to select the best science, creating global execution & speed to market? This is not easy for most companies as it requires a shift in culture, mindset, and it takes time, focus and commitment from senior leaders to adopt and influence change. Open innovation operating models should be viewed as a journey driven by strategic vision; one cannot expect full success in the short-term. It is a long-term strategic commitment to where organizations have to evolve, iterate, fine tune over and over again; quick wins always help instill confidence and engagement in the organization. Simply coming across a great new idea is not enough, in order to maximize, translate and capitalize on a great idea you need the organization to be ready and have the mindset to quickly act and leverage the idea. You need internal R&D and marketing expertise to screen many ideas and transform that one great idea into value propositions to create life changing opportunities. You need the right mix of skills internally evaluating these opportunities – openness to new ideas balanced with the rigor in due diligence. Another important aspect of organizational cultural for an open innovation model is cultivating a culture of risk-taking and embracing a culture of failure. Since transformational ideas are by definition high risk in nature, it is important for leadership to reward risk taking and nurture a culture of fast failure. In order to fully maximize open innovation we have to look beyond just product-based innovation and look to full spectrum innovation – identifying the sweet spot between consumer needs, new science and new business models. Terwiesch and Ulrich in their book “Innovation Tournaments” describe a systematic approach to producing and choosing high potential innovations by designing innovation tournaments (internal/external), pitting competing opportunities against one another and then consistently filtering out the weakest ones until those with highest potential remain. In 2016, Johnson & Johnson Innovation and Janssen announced $1.5 Million in Grants for World Without Disease QuickFire Challenge. Johnson & Johnson Innovation and Janssen selected the 3 companies (RMIT, Glyscend and Neurotrackeach receiving a grant of $500,000) from over 470 global applicants with solutions across the pharmaceutical, medical device and consumer sectors. Johnson & Johnson Consumer Inc. has embraced this model to co-create with the world to accelerate new consumer solutions. We believe that a great idea can come from anywhere. We also know that we have unmatched scientific, R&D and marketing expertise to transform great ideas. Through the utilization of a collaborative approach, we have seen many great opportunities to create meaningful innovations that impact the lives of people. Our strong external innovation ecosystem helps to supplement our organic innovation capabilities through value-creating partnerships. Working together with academic centers, entrepreneurs and emerging companies, we help advance breakthrough healthcare solutions and bring them to the people who need them most. By synthesizing the strengths of external experts across complimentary areas and categories they are able to (1) Discover solutions across the globe at start-ups, universities, suppliers and companies, (2) Design solutions to fit consumer needs, strong business model and disruptive technology, (3) De-risk solutions by iterating, rapid prototyping and market experiments, and (4) Deliver solutions in accelerated way to our consumers. Rest Devices, Inc., the makers of the Mimo Baby to develop the first smart, personal baby sleep coach system. HAX, a hardware accelerator in Shenzhen (China), to scout and accelerate promising start-ups in the Joint Consumer Health Device Accelerator Program. S-Biomedic, a biotech start-up using cutting edge technology to produce live probiotic cosmetics aimed to modulate acne bacteria in order to cure and prevent acne. Xycrobe Therapeutics, a microbiome startup company that focuses on the development of treatments for inflammatory skin diseases. Xycrobe’s technology includes a host of bacterial strains that create a symbiotic relationship living on the skin to reduce skin inflammation associated with acne and eczema. Acknowledgments: The authors want to thank Ying Jia, PhD for designing the cover for this blog. 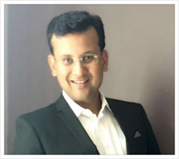 Guest Author: Prithwiraj Maitra, Ph.D.
Prithwiraj Maitra, Ph.D.is currently Associate Director & Research Fellow, Head of Global Face Care Upstream Innovation Platform at Johnson and Johnson Research and Development located in Skillman NJ. Dr Maitra is responsible for delivering balanced innovation portfolio with focus on key strategic priorities & consumer unmet needs on Anti-aging, Acne, Fairness & Tone benefit areas & develop robust innovation pipeline for JNJ’s global beauty brands- Neutrogena, Aveeno, RoC, Clean & Clear, Neostrata. Key responsibilities also include developing a culture of innovation, nurture & inspire talent to develop future R&D leaders. Prior to joining Johnson and Johnson in 2009 Dr. Maitra held several positions of increasing responsibilities at Avon’s Global R&D center in Suffern, New York where he was responsible for technology scouting and driving upstream innovation for color cosmetics and skin care. Prithwiraj received his Ph.D. in Polymer Chemistry from Temple University in 2003 and executive leadership certification on Innovation and Strategy from MIT Sloan School of Business in 2015. Prithwi is author of several peer reviewed publications and book chapters and is often invited speaker, chair at several national and international conferences. Prithwi is inventor on over 40 patents or patent applications.